We are thick in the middle of the most hilariously named bowl games, and while Wednesday’s Frisco Bowl can’t compete on that front with this, the day before, or this, the day after, perhaps we can take some solace in the fact that until last year the Frisco Bowl was the Miami Beach Bowl, meaning all of these players were at least somewhat disappointed to be here. It’s the true spirit of bowl season! Also, there were trick plays. Ohio whomped San Diego State 27-0—the Aztecs’ first bowl shutout loss since they fell [checks notes] 53-0 to Hardin-Simmons in the 1948 Harbor Bowl. 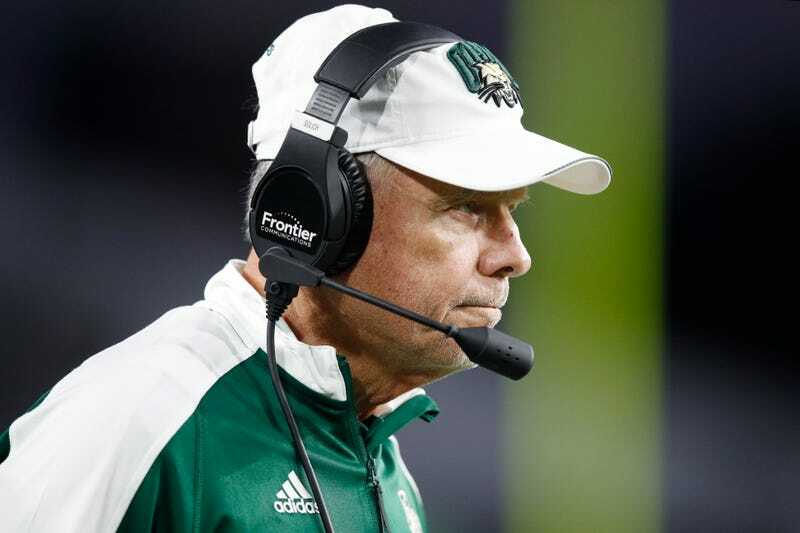 It’s the second straight bowl win for the Bobcats under 74-year-old Frank Solich, who became FBS’s oldest head coach when Kansas State’s Bill Snyder retired earlier this month. Nathan “Air Canada” Rourke accounted for all three of Ohio’s TDs in this one, including the first, a QB keeper that every single member of SDSU’s defense didn’t realize was a keeper. Ohio did not lay off the creativity, even up 20-0; their final score was a flea flicker, with RB A.J. Ouellette tossing the ball back to Rourke to find a wide-open Andrew Meyer for the touchdown. Ouellette leaves as the program’s third leading rusher all-time, and has NFL hopes. His best friend, Rourke, will return for his third season as a Bobcat. And Solich will be back for his 15th. Why go anywhere else?